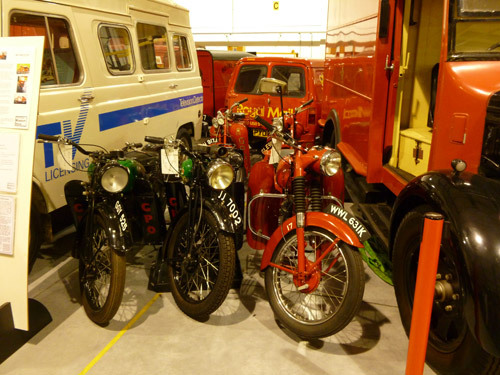 Venture off the beaten track on Thursday 16th May and explore the treasures of the British Postal Museum and Archive (BPMA) Museum Store at a special after-hours event. Behind its unassuming façade, the Museum Store houses a wonderful collection of the BPMA’s larger exhibits – each with a story to tell. As part of Museums at Night 2013, come and find out about some of these stories as they are brought to life by The Big Wheel Theatre Company! Morris van at the Museum Store. What can you do on the night? Show your support for our resident Suffragette for the evening by making your own rosette, reminiscent of those worn by the campaigners who fought for Women’s rights. East London craft company, Craft Guerrilla, will be running the activity. All materials provided for free, just bring your creativity and enthusiasm! Explore our Second World War handling box. 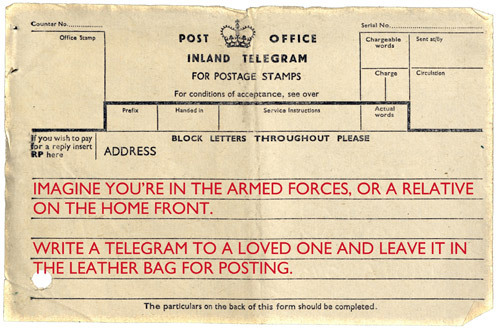 Dress up like a wartime post man, and write a telegram to a loved one. Write your own Post Office Telegram. 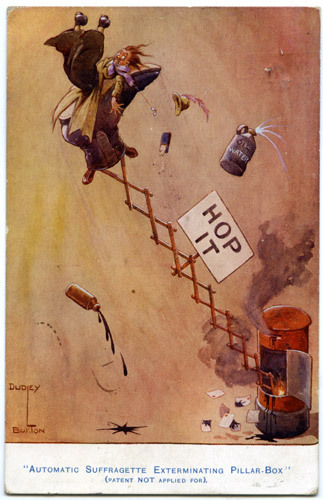 Postal fun at the Museum Store! Take a walk down ‘letter box alley’ or take a look at our fleet of postal service vehicles illustrating the long history of moving the mail in a self led exploration of the collection. BPMA staff will also be on hand to answer questions about the collection. When you leave you will be able to recognize a hen and chicks bike, a K2 telephone kiosk and an Edward VIII pillar box! 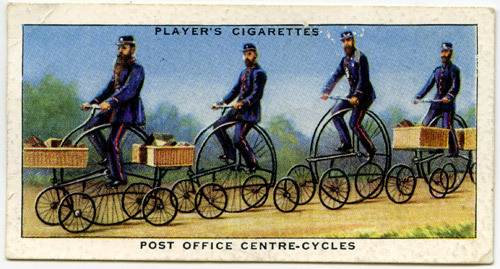 Hen and chicks cigarette card. At an event celebrating stories from our past it only seemed right to have a vintage themed refreshment stand! Help yourself to a selection of home made cakes and finger sandwiches, cloudy lemonade or a hot drink – all absolutely free. Visit our website to find out more about our Museums at Night event. Join us on Saturday 6th April, 10am-4pm as we open the doors of our museum store to reveal some of these fascinating tales. There will be a range of activities for all ages to celebrate this British icon – the pillar box. Pillar boxes at the Museum Store. What can you do on the day? We will be running a series of ‘spotlight’ talks, where you can hear about the stories behind some of our favourite pillar boxes. Highlights include one of the earliest boxes trialled on the Channel Islands and the ‘Penfold’. Why did Liverpool request a ‘special’ box? What indeed will you learn from hugging a pillar box? Come and find out more, with our staff on hand to introduce you to the wonderful world of pillar boxes! Our curators will give you a quick introduction to pillar boxes. 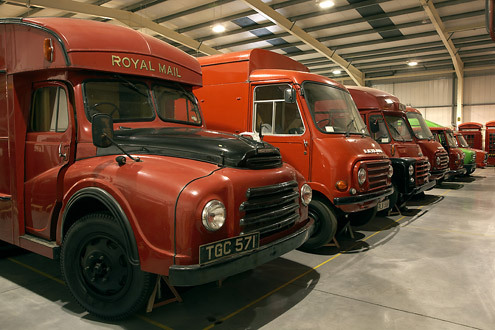 Take a walk down ‘pillar box alley’ or take a look at our fleet of postal service vehicles illustrating the long history of moving the mail in a self led exploration of the collection. BPMA staff will also be on hand to answer questions. Postal vehicles at the Museum Store. 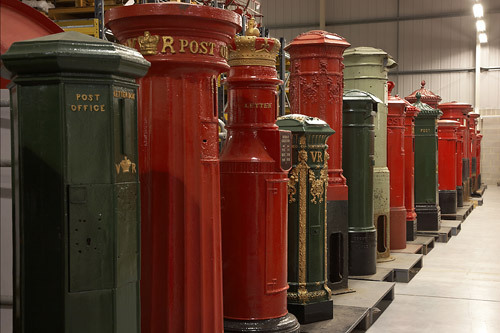 Past and present, the pillar box has played an important role in a process which has had a remarkable impact on the lives of many – communicating through letters! But what journey does a letter take from it leaving the hands of the sender to it being popped on the door mat of the receiver? Find out by having a go at our trail around the store! Hunt for objects and solve puzzles to reveal this amazing journey. 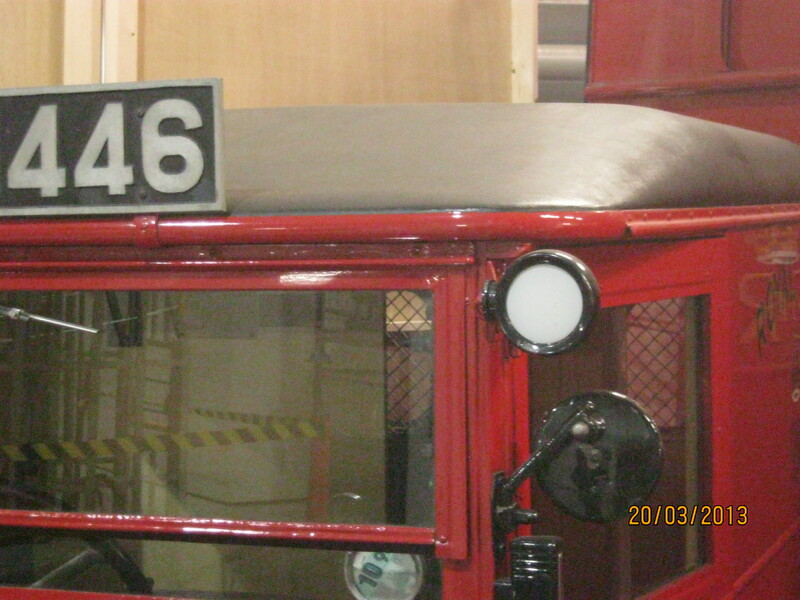 Here is a teaser from the trail – but you’ll have to come to the store to find out the mystery object! Can you identify the mystery object? 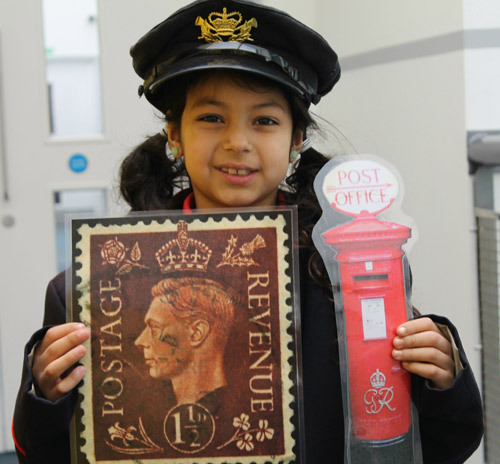 Get creative by designing and making your own pillar box! Celebrate the important role it played in the letter sending journey by designing it to hold your important letters – maybe it could store your post cards or letters from pen pals! What will your pillar box hold? What about your post cards? 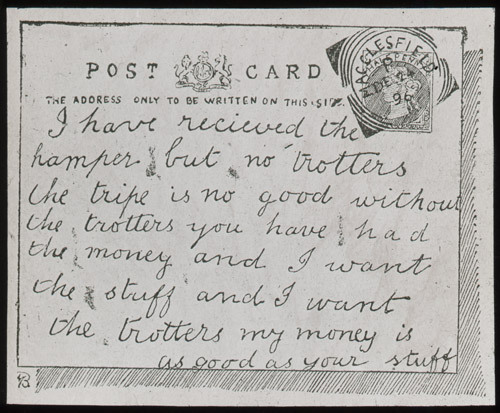 This post card from our collection was never delivered, perhaps the rather upset writer of the card received their trotters just before feeling the need to send it! We look forward to seeing you on Saturday 6th April at the museum store! 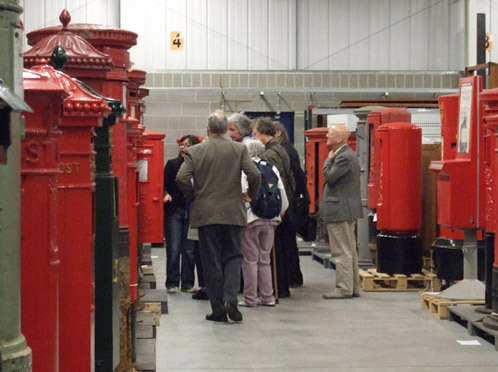 Pillar Box Perfection is a free event taking place at The British Postal Museum Store, Essex, on 6 April 2013. See our website for more information and travel advice. 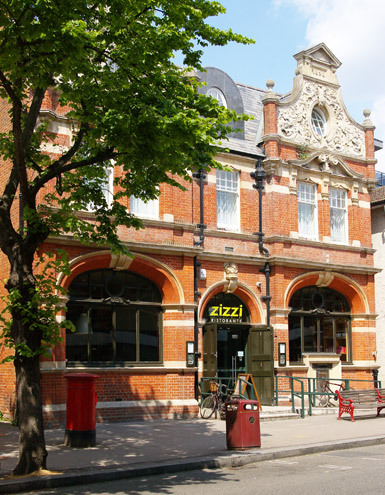 On Saturday 31 March our Museum Store in Loughton, Essex will host a day of activities especially for families. 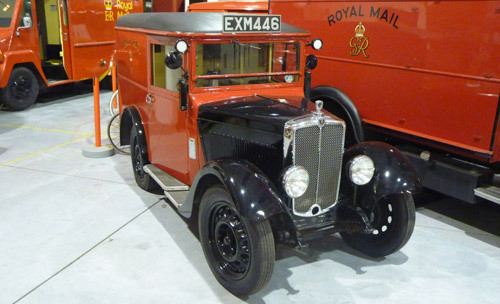 This free event will include short tours of our collections of vintage postal vehicles and post boxes, film screenings, craft sessions, and the chance to handle some original objects and try on postmen’s uniforms. Our collection of vehicles and post boxes includes the London Ornate pillar box, which has a compass on top in case you get lost whilst posting your letter, and the Inspector’s Bicycle, which has the letters GPO (General Post Office) in the chain wheel. Take a tour with our curators to learn even more about our holdings. Artist Michelle Reader will be on hand throughout the day to help you make mini sculptures using recycled materials like cardboard, old CDs, plastic objects and buttons. Be inspired by our vehicles and see what you can create. We will also screen films made by the GPO Film Unit, who documented the General Post Office’s work in the 1930s and 1940s. Of particular interest is A Job In A Million which followed John Truman, as he joined the Post Office as a trainee messenger boy. The Family Fun Day runs from 10am-4pm on 31 March at the BPMA Museum Store, Loughton. The event is free and there is no need to book. Visit our website for full details and travel directions. The Family Fun Day is part of the 2012 Loughton Festival. The Festival is raising money for Haven House Children’s Hospice. A collection will take place during the event, with all proceeds to this worthy cause. 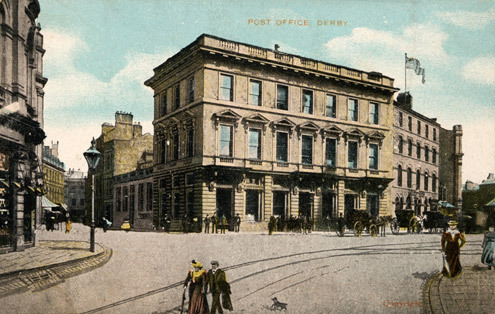 Despite the importance of the post office in the lives of our communities, it has surprisingly been overlooked by architectural studies: furthermore, historians of the Post Office have by and large concentrated on its administrative history, with only passing reference to its buildings. 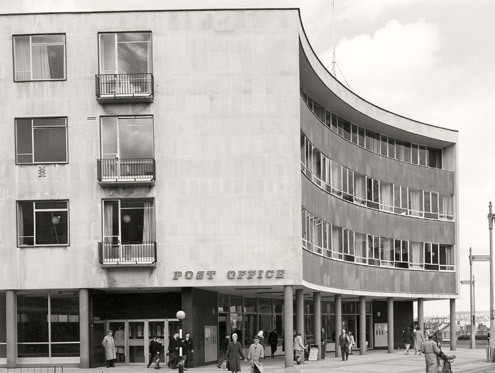 In an attempt to redress the balance Built for Service: Post Office Architecture (published by the BPMA in 2010) chronicles the history and development of the post office building in Great Britain from the mid-19th century to the 1970s. 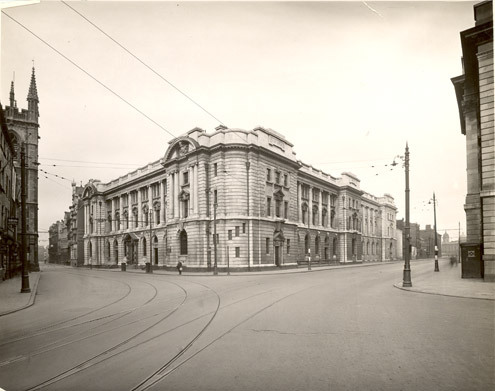 Although new post office buildings were commissioned by the Post Office, execution of the work was the responsibility of another Government department, the Office of Works and its successors. This duality of purpose, with the tensions that it created up until the First World War, is described in the book, and means that historians are required to research in two major repositories: for plans and contract drawings (where they have survived), the National Archives at Kew; and for the role of the Post Office, the British Postal Museum and Archive, although they are by no means mutually exclusive. 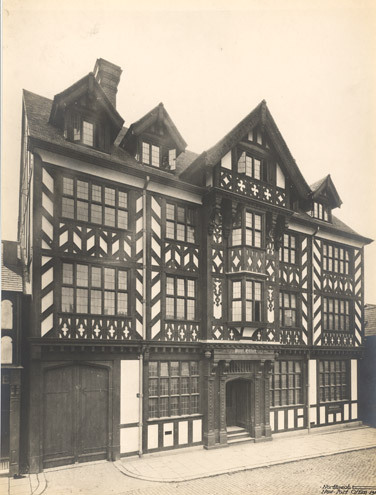 One of the joys of study in the BPMA Archive is of course working with the catalogued material, which reveals how assiduously the Post Office took its responsibilities with regard to the fitting-out of its buildings and the welfare of its staff, but also with the extensive ephemeral material in the Portfolio files. Here may be found a wealth of unique material (such as programmes of opening ceremonies), revealing details about dates of opening of new post offices, and names of architects, as well as correspondence, press cuttings, unpublished research papers and a fine selection of photographs. 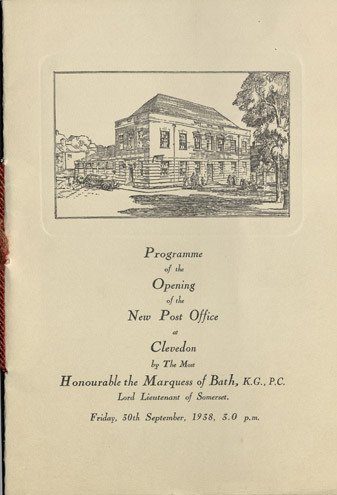 Souvenir programme of the Opening of the New Post Office, Clevedon. One of many such items in the BPMA Portfolio collection. 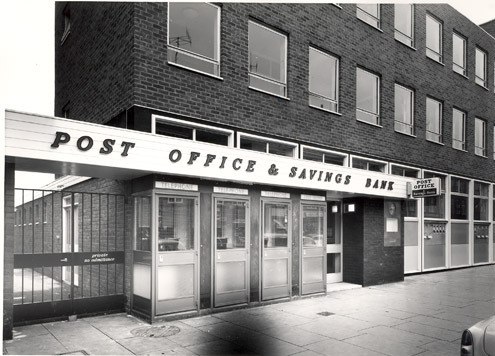 The recent spate of post office closures has begged the question: what happens to redundant post office buildings? Do they still have a presence on the high street, and if so, what has happened to them?. 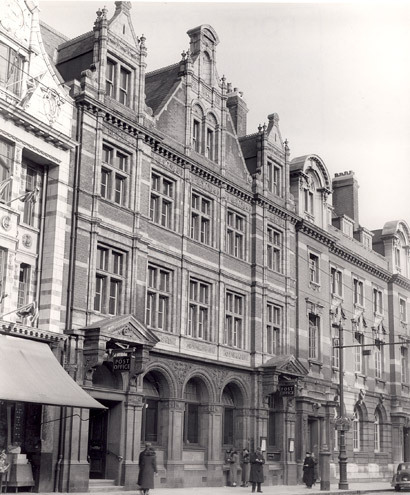 Many Victorian and Edwardian post offices have been statutorily listed as Grade II structures. This generally means that their external appearance is protected, while the interiors can be altered to suit a new purpose. 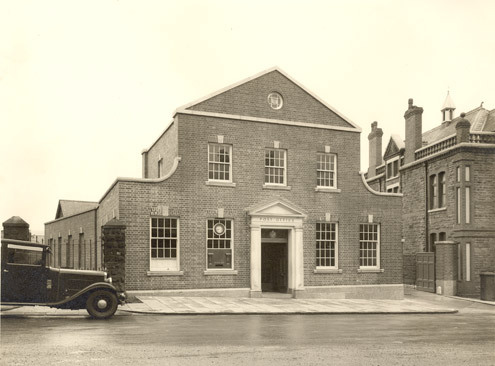 Many inter-war post offices, no longer required by the service, have also survived demolition. 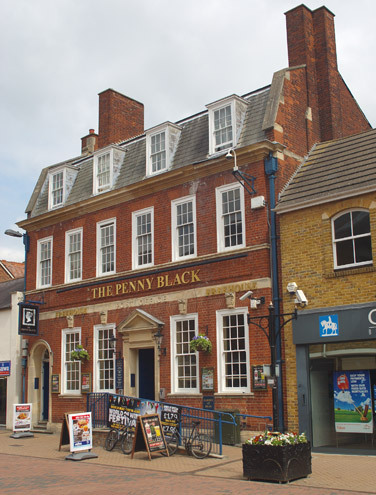 The nature of these buildings, featuring a large open space on the ground floor, has meant that it has been relatively easy to convert them into public houses, nightclubs, and chain restaurants. 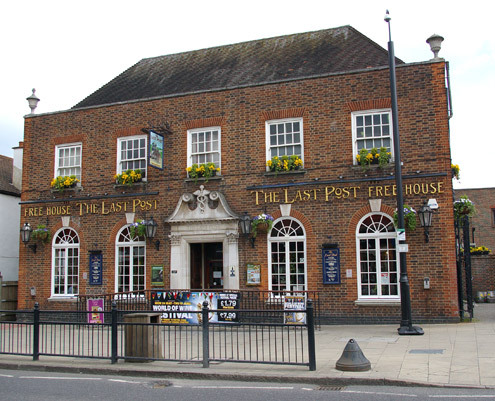 The names of many of the public houses recall the former association – “The Last Post”, “The Old Post Office”, “The Penny Black”, and so on. In many cases, the upper floors of these buildings have been converted into residential use. Built for Service serves as an introductory guide to the post office building, but it is supplemented by a website. This is an alphabetical illustrated guide, detailing years of opening, names of architects, archive sources for further research, bibliographical references, and current use (if no longer a post office), with links to further information available online.